Luxurious yet understated is the very essence of Aman hotels in Rajasthan, and the perfect contrast to the whirlwind of experiences you’ll have whilst exploring Delhi, Ranthambhore and Alwar. This sophisticated journey introduces you to many different facets of India whilst staying in some of her finest properties; the Aman hotels in Rajasthan. This luxury tour, with Aman hotels in Rajasthan, kicks off with a two-night stay at the Lodhi, in the capital city of Delhi. The Lodhi is no longer an Aman property though has retained its low-key luxury and Aman vibe; nor is it located in the Rajasthan region, though the capital city of New Delhi is often the most convenient port of entry to India for our guests. Your experienced guide will introduce you to the contrasts of both Old and New Delhi; from its souk-like bazaars in Chandni Chowk, to the colonial tree-lined avenues of Lutyens. We then board the train to Ranthambhore National Park, a former hunting ground of the Maharaja of Jaipur and now one of the best places in the world to spot wild Bengal tigers in their natural habitat. Aman-i-Khas is one of the finest safari lodges in the world, and each luxury tent comes with its own butler. Our experienced and passionate naturalist guides will accompany you into the jungle on the trail of tiger. Between-hand, enjoy your surroundings at Aman-i-Khas. The journey ends on a relaxing note, at arguably the most luxurious Aman hotel in Rajasthan; Amanbagh. This opulent gem of a resort is located off the beaten track in rural Rajasthan, nestled within the Aravalli hills. Amanbagh is a gorgeous place to relax, surrounded by the Aravalli hills and dotted with lush palm trees. For those who’re feeling active, there are a number of excursions to embark on; from a sunrise yoga session at the abandoned local temple, to meeting the local villagers on Amanbagh’s signature ‘Cow Dust Tour’. The Chhatri dinner is an impossibly romantic ending to this luxury sojourn through Aman hotels in Rajasthan. Your luxury India tour with Aman hotels kicks off upon your arrival in Delhi, you will be met by a member of our team and chauffeured to the Lodhi for a two-night stay. Whilst no longer an Aman hotel, it is arguabaly the finest in New Delhi. Previously part of the Aman group, the Lodhi is arguably the finest hotel in New Delhi. It’s nestled in a busy but green area of the capital, close to the Lodhi Gardens of which it takes its name. The atmosphere here is cool and hushed; the décor is sleek and minimal. Rooms are huge and come with their own private plunge pool. Today, accompanied by an Aman butler, you’ll board the train to Sawai Madhopur in Rajasthan, for a three-night stay beside the jungle. Or, the journey is driveable should you prefer (similarly, helicopter travel or a private charter can be arranged). Either way, upon arriving into Ranthambhore this evening you’ll be assisted with checking in to Aman-i-Khas, the first of your Aman hotels in Rajasthan, for a three-night stay. This super chic camp is nestled on the edge of Ranthambhore National Park, surrounded by the Aravalli hills. Each of the ten luxury tents offers generous space (over 1100 sq ft), luxe Mughal-inspired interiors, and your very own private butler. The central fire-pit is ideal for congregating with other guests in the evenings, to discuss sightings in the park and enjoy sundowners. This is luxury camping at its best and affords an authentic Indian safari experience. Rise early this morning and you’ll be met by your private Jeep, to head off into Ranthambhore National Park on a morning safari. The park’s most famous resident is the majestic Bengal Tiger, though is also home to leopard, peacock, numerous species of deer, crocodiles, sloth bear and much more. After the morning safari, you’ll return to Aman-i-Khas for breakfast and a few hours at leisure. Here you can relax, explore the local area, or discuss sightings with staff and other guests. In the afternoon, you’ll head back into the park for a second Jeep safari, to observe the jungle in a different light. Enjoy a leisurely morning at Aman-i-Khas today (whilst most other guests of the hotel are on safari this morning, you’ll likely have the pool to yourselves!). 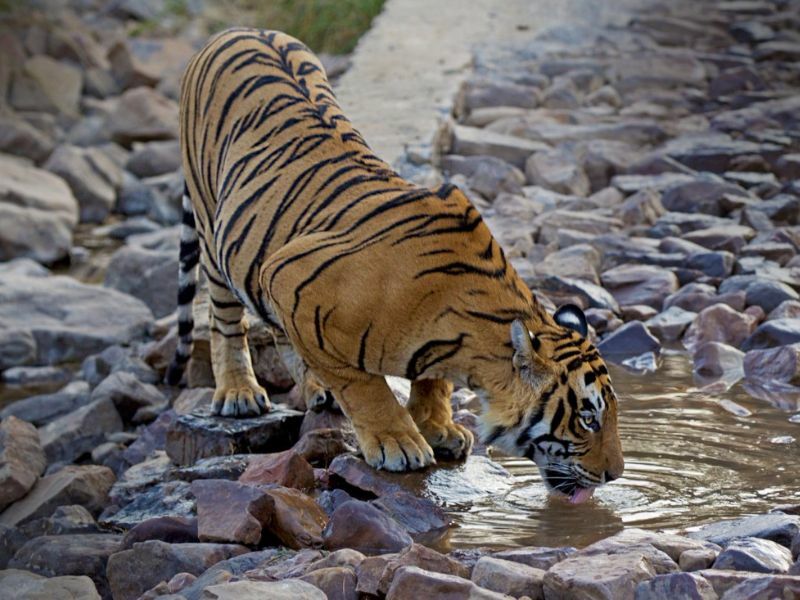 Or, if you’re feeling active, explore the 10th century Ranthambhore Fort for a spectacular birds-eye view of the jungle. It’s located within the park itself and its crumbling chhatris and ancient temples provide a magical backdrop to the reserve, evoking a Jungle Book vibe. Later, steer off the beaten track to Alwar, for a relaxing two night stay at Amanbagh, the second of your luxurious Aman hotels in Rajasthan. Nestled on the outskirts of Jaipur, Amanbagh is a whisper-quiet Aman retreat, whose name translates to peaceful garden. Shaded courtyards, rose-tinted walled and regal cupolas evoke the majesty of the Mughal era and will leave you feeling like a modern day Maharaja. The suites at Amanbagh are spacious and extremely comfortable, offering either a private garden or courtyard. The next two days are at your leisure to enjoy your surroundings at Amanbagh. The central swimming pool is ideal for relaxing and unwinding, as is the spa and library, though if you’re feeling active and would like to explore rural life in Rajasthan we’d recommend Amanbagh’s signature Sunset Cow Dust Tour. This experience whisks you through the village in an open-top Jeep: smiling children play in the streets, and farmers herd their cows, goats and buffalo. In the mornings, the spooky spectacle of Bhangarh makes for a fascinating excursion. End your journey through India and the Aman hotels in Rajasthan on a special note with a private Chhatri dinner; an impossibly romantic experience. This luxury India tour with the Aman hotels in Rajasthan is merely a suggested itinerary – it can be tweaked to better suit your tastes. For example, you may like to include a stay in Agra to visit the Taj Mahal (we’d recommend the Oberoi Amarvilas) or end your journey in the romantic city of Udaipur (may we suggest the Taj Lake Palace). We would encourage you to ask for any number of amendments – every aspect is flexible, from the accommodation to the destinations to the length. All our tours are tailor-made and can be refined to complement your preferences, with every detail designed around you. This luxury India tour with Aman hotels in Rajasthan is best explored from October to March.